Saturday was my best friend Kaitlin's birthday. To celebrate she gathered a group of friends for brunch. We met at Poco in the East Village at 2pm. so it was somewhat fitting to throw a celebration there. where standard drink prices range from $12 to $16. and coworkers that up until then I had only heard about. so I could take advantage of the 25% off sale they were having. I ended up getting cute flats that of course were not included in the sale. Then we took a walk along the river to snap some pictures. On Saturday, JD and I did a little shopping. I convinced him that he needed red pants. I recently bought a pair myself but haven't worn them yet. I think he looks really cute in them. I wonder how long before he demands I take this picture down. I LOVE your chloe bag. I love seeing the water in NYC...I lived on the east river on the UES when I was there, it was such a nice break from the crazy city. My top in that pic is James Perse btw! I hate when that happens! You fall in love with something only to learn that it's the only thing not on sale. The shoes you're wearing in the picture are quite adorable! Thank you Sienna and Lauryn! Lovely pictures! Sounds like it was a perfect day in the city. I can't believe you got him to wear red pants... and even more unbelievable, they look good! 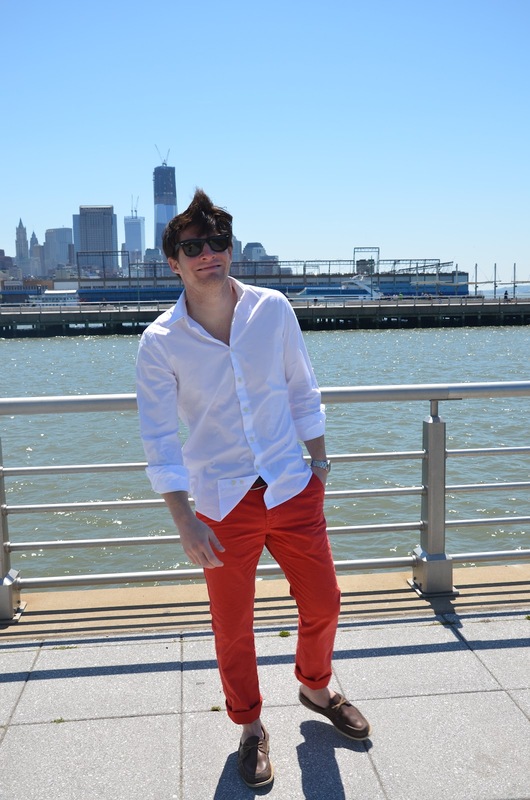 More men should rock the red pant look. I dig it. You have great style! Love your bag! Very cute look!